Soil liquefaction is a process in which strong ground shaking from earthquakes or other sources cause the ground to begin to lose its strength and flow like a liquid. An analogy that has often been used is that the solid ground is transformed by the shaking into something like quicksand. Structures can sink into the liquefied soil and be damaged or destroyed. The idea that soil could behave like a liquid was first suggested in 1920. Other phenomena associated with soil liquefaction include the appearance of sand boils or sand blows. These are are similar to small mud volcanoes in which water erupts in a sudden stream from the ground. Soil liquefaction happens because seismic waves increase pressure through the soil. A common type of seismic wave is the primary or "P" wave. The P wave is a type of sound or pressure wave that is produced by an earthquake. It travels away from the earthquake source at speeds of about 13,000 miles per hour (22,000 kph) near the earth's surface. As the wave travels along, it alternately compresses and expands the soil it travels through. Soil usually contains water, and compressed soil can't hold as much water as uncompressed soil. The compressions from the seismic waves can change soil from being partly saturated with water to being fully saturated with water. When this happens, the soil grains are forced apart and the soil loses its strength. When it loses its strength, the soil can flow like a fluid. This process usually happens at high Mercalli Intensities (a measure of earthquake intensity in a particular area) — in this case, about MI IX to MI XII. As the soil begins to flow, it is generally forced upward towards the surface of the earth. Structures that have been built in areas where the soil liquefies can be severely damaged. Concrete foundations crack as the ground beneath them loses the ability to the support them. This process can lead to the destruction of the building itself. Recent earthquakes in which liquefaction was observed include the M6.2 earthquake on February 22, 2011 in Christchurch, New Zealand. This earthquake was centered 2 km west of the town of Lyttelton and 10 km southeast of the center of Christchurch. The earthquake caused extensive soil liquefaction in the Christchurch area, and led to the severe damage and destruction of more than 1000 buildings there. To determine which areas are most prone to soil liquefaction, geologists create maps. An example is shown here; this is a "soil liquefaction potential" map for the San Francisco Bay region. 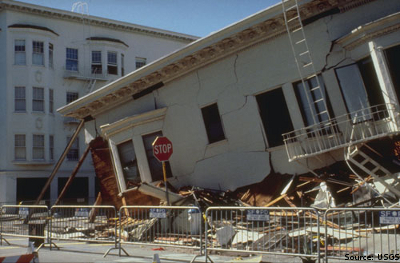 Among areas that may liquefy in a future earthquake are the Marina district in San Francisco, Foster City, and the Embarcadero. The Marina district was, in fact, heavily damaged in the M7.0 Loma Prieta earthquake on October 17, 1989. 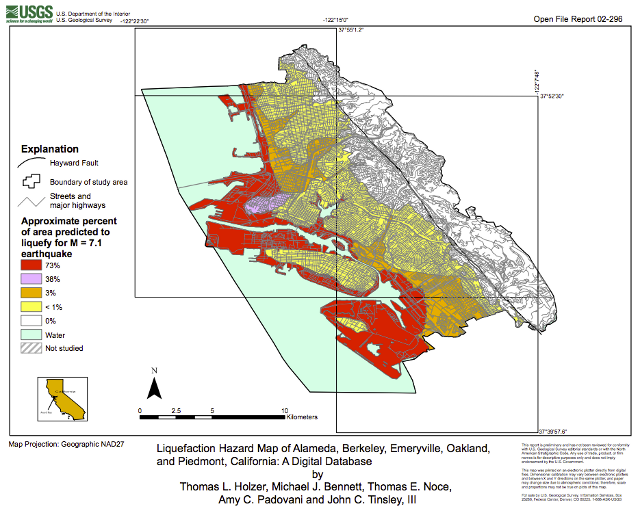 Seismic liquefaction potential map of Alameda county prepared by the US Geological Survey. The Hayward fault runs along the Eastern side of the Alameda county. That fault was responsible for the Magnitude 7 earthquake of October 21, 1868. Source: US Geological Survey. 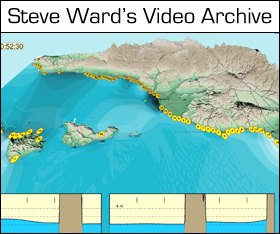 The land in these regions are a combination of landfills and San Francisco Bay mud. Some of these landfills are very old, and were the result of damage from the San Francisco earthquake of 1906. In that earthquake, damaged buildings were bulldozed, and the debris was pushed into the bay. As time passed, new structures were built on the landfill. Unfortunately, it has been found that landfill is one of the easiest soils to liquefy under conditions of strong seismic shaking. For that reason, these areas are at high risk for liquefaction and significant damage from future large earthquakes.